If your Audi brake warning light (or ABS light) come on or are flashing while driving or at startup, stop immediately and check the brake fluid level. Also, double check the parking brake making sure it is fully released. In this guide, you will find instructions on how to check Audi brake fluid level and add brake fluid on most Audi models including A3, A4, S, Q3, Q5, Q7, TT. Always use the brake fluid type printed on top of the brake fluid reservoir. 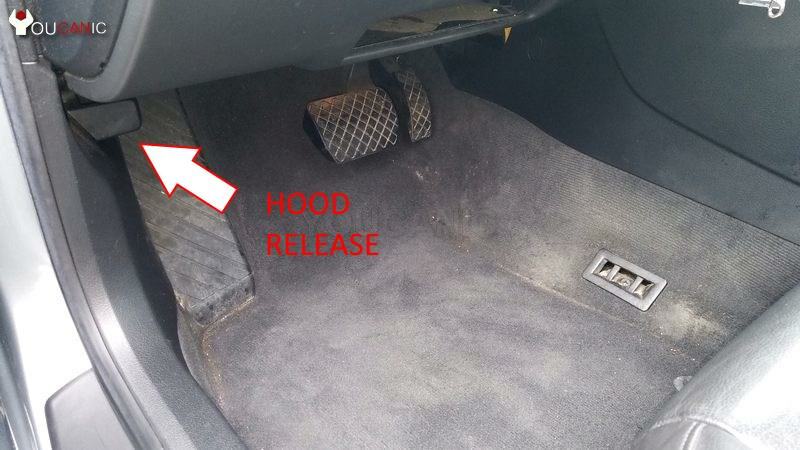 Pull the hood release under the dashboard of your Audi. Open the hood and secure it in the open position. Locate the brake fluid reservoir on your Audi. Clean the brake fluid reservoir with clean cloth. Check the current fluid level. Ensure the current brake fluid levels is between the maximum and minimum marks on the side of the reservoir. If the brake fluid level is below the minimum level, continue to the next step. Look at the cap of the brake fluid reservoir and determine the correct brake fluid type. Add brake fluid until the level reaches just below the MAX/Full mark. Do not fill Audi brake reservoir above the maximum mark. Note that an Audi brake light staying on at startup can indicate a problem with the brake system but also an issue with the charging system or battery. If the voltage from the alternator or battery is too low it can trigger the brake light to stay on.